My colleague passed to me a copy of this..at first glance I thought it's just another product sale leaflet. 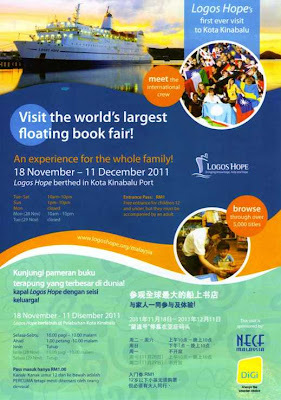 At second look, it's actually something new in town, the Logos Hope will be in Kota Kinabalu for the first time from 18 November to 11 December 2011, just in time for the School holiday break. There are over 5000 titles of books to choose from on their fully air-conditioned deck that opens from Tuesday to Saturday from 10am - 10pm, and on Sunday from 1pm to 10pm, Monday - closed. 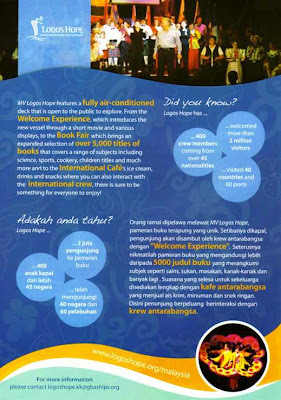 The entrance fee is RM1.00, free entrance for children under 12. It would be a good opportunity for school students, parents and book lovers to visit Logo Hope this school holiday..a great outing for the whole family to experience. Logos Hope is there in KK? Wow! I did blog about our experience when it docked at Port Klang last month. Guess their next stop would be in Sandakan port. Remember those days when I was still in Sandakan, I would not miss a trip to Logos or was it Doulos last time?